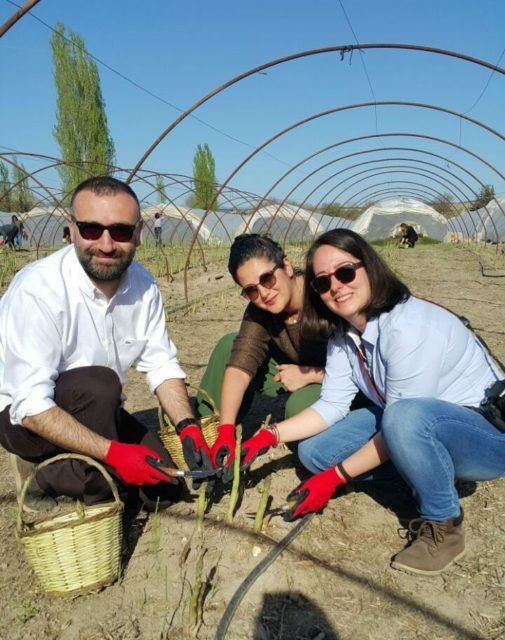 Last week I was invited to attend an “asparagus harvesting” trip in Sarıcakaya district of Eskişehir (located approximately 240 km west of Ankara). My friend Arman Badur and partner Murat, who are the founders of NOMAD Agriculture, has been growing asparagus for the past 10 years. Arman has set his heart on asparagus after falling in love with it while studying in Europe, and became the first and so far the only asparagus farmer in Turkey. 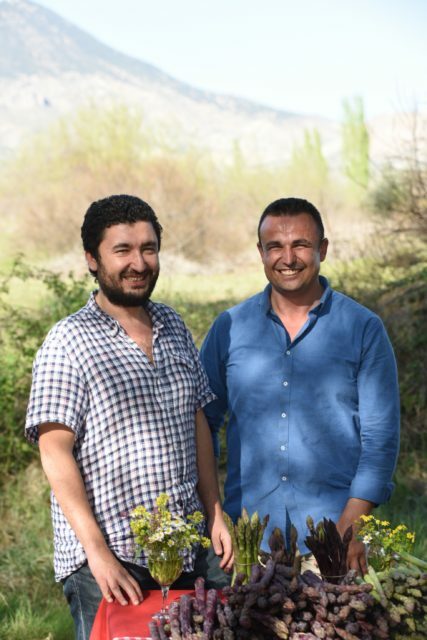 Laid out on 50 hectare of land, together with his partner Murat he grows green and purple asparagus. Apparently botanically speaking there are only two types of asparagus. The green one that we are so accustomed to see, and the purple kind, which is higher in sugar content therefore perfectly suitable for raw consumption. The white asparagus is actually the green kind that has been grown under the soil, lacking sunlight therefore chlorophyl that gives asparagus its green color. Upon arrival at the asparagus land, we were greeted with the most beautiful scenery; a buffet consisting of sauteed, grilled asparagus, barbequed lamb shops and ribs, “siyez” rice pilaf with asparagus and purple asparagus “cacık” (the traditional cold yoghurt soup). The picnic tables were set next to the fast-flowing Sakarya river, all decked with red and white checkered table cloths, freshly picked wild flowers and gourmet olive oils. Our delicious lunch was accompanied by red wine produced in a boutique winery in Tekirdağ (they haven’t fully established a brand yet, but once they will, I will let you know). The weather was mild in low 20’s C with a very gentle breeze, we ate a delicious lunch at our comfy picnic tables. 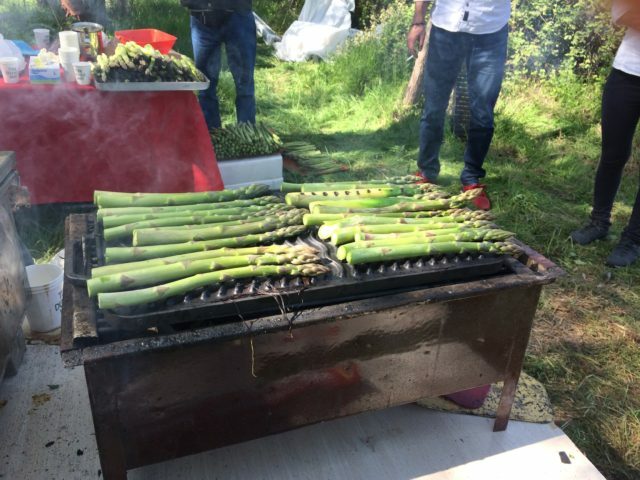 After lunch was over it was time to work…at the asparagus fields. Following a brief lesson on asparagus harvesting, we scattered around the field with a basket and a special asparagus knife and started to harvest asparagus. The key points that one needs to pay attention are; to cut only the ones that are minimum of 24cm long, placing the knife parallel and as close to the soil as possible when cutting and the last but the most important point is if the asparagus you are about to cut is closely positioned with a another sprig that is not ready for cutting, you have to make sure that your knife should not even touch the smaller one, other wise the small one grows in an arch form making it a casualty and not appropriate for sale. 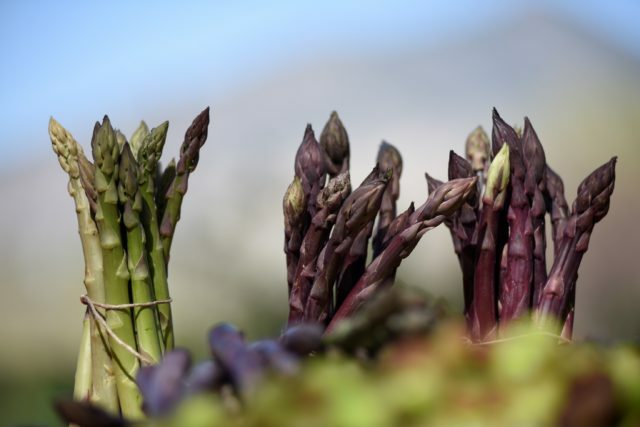 How the geography and soil impacts the quality of an ingredient is visibly seen and tasted from NOMAD Agriculture’s asparagus. The dinner consisted of a feast of asparagus once again. There was white asparagus pickle aromatized with rose vinegar, white asparagus with Hollandaise sauce (the classic! ), roasted quail accompanied by sauteed asparagus medley and finally some slivers of candied asparagus on vanilla ice cream. One always has to know the benefits of food items in my opinion and I am happy to find out that asparagus is a fibrous vegetables, rich in vitamins A, B1, B2, B6, C, folic acid, phosphor and potassium. Asparagus is also good for strenghtening the heart and cleanses the blood. In Anatolia, arrival of spring, bears a plethora of spring season’s wild herbs. Wild asparagus being the most common is spotted in local bazaars and marketplaces. 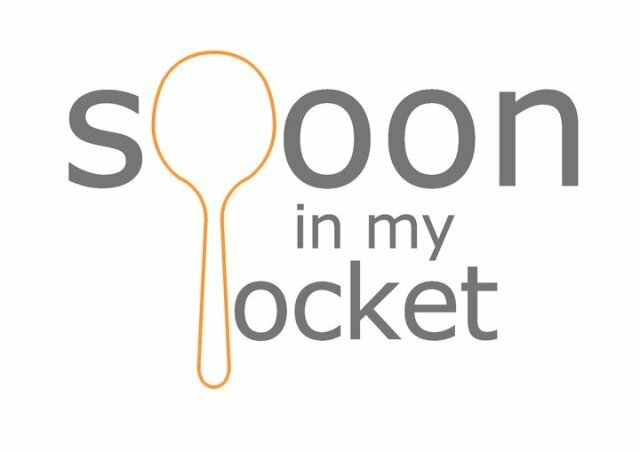 Although it takes on various names (e.g. 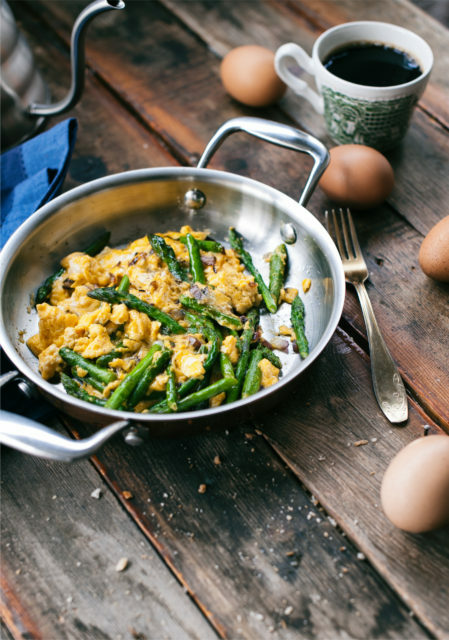 sarmaşık, avronyes, izvinye, aspariçe, asfaraca, tilkişen) in different regions, and when you ask a local how to cook it, they will all give the same recipe; sautee the cut wild asparagus and mix with scrambled eggs. Eggs, beef and pasta are most most common pairings with asparagus but if you get a chance I would advise you to also try it with yoghurt, especially the purple ones, which are great consumed raw. Quite a versatile vegetable it has high flavor profile and goes great with so many different kinds of food items. I would like to thank my friend Arman Badur and his team and NOMAD Agriculture for making this delicious vegetable accessible and for their efforts to introduce it to Turkish people.